A POLITICAL beat has run through ska music since its creation in Kingston in the late 1950s. It was music to dance to—an up-tempo fusion of horns, Rastafarian drumming, American jazz and rhythm and blues—that also engaged with the issues of the day. In 1962 the energetic, celebratory nature of the music made it an uplifting soundtrack to Jamaica’s transition to independence from Britain. Songs with titles such as “Forward March”, “Independence Ska” and “Freedom Sounds” were played wall-to-wall in dancehalls. Early hits included “Simmer Down” (1963), in which the Wailers and the Skatalites denounced violence and crime in the city’s ghettos; in “Wash, Wash” (1963) Prince Buster lamented a life of penury. The genre was taken up by groups further afield, who adapted it to reflect their own concerns. 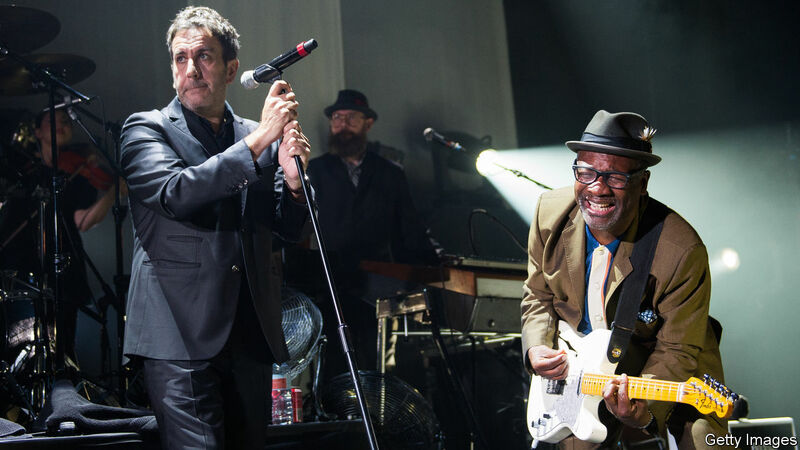 In Britain in the late 1970s and early 1980s, bands such as the Specials championed a harder-sounding style of ska, inspired by punk’s searing lyrics and guitar riffs. Their songs addressed racism and urban blight and took aim at the policies of Margaret Thatcher’s government. In the 1990s American bands such as Sublime and No Doubt added pop hooks and took the genre into the mainstream. In the 21st century Asia has proved a new frontier for the music. The Ska Vengers, a group based in New Delhi, have made headlines across the globe for their catchy tunes criticising Narendra Modi, India’s prime minister, as well as human-rights abuses in the country. Now ska is undergoing another revival of sorts in the West. Bands which had their heyday decades ago are producing new music that responds to current events. Mephiskapheles, a group based in New York, was celebrated in the 1990s and has begun touring again in recent years. They have said that their most recent songs—with lines such as “in the court of public opinion, any fool can be a king”—were inspired by the candidacy of Donald Trump. The Mighty Mighty Bosstones, who last year organised Cranking and Skanking, a dedicated ska festival, also released “While We’re At It”. One track, “Divide”, describes an “unstable and erratic” leader; “Here We Are” considers a nation in freefall. “There’s usually a pretty damn good message, socially or politically or otherwise in ska music,” Dicky Barrett, the lead singer, has said. Other established acts such as the Skatalites, the Toasters and Less Than Jake are making themselves heard, but most significant of all is the return of the Specials (albeit with some new members). Formed in Coventry in 1977, and central to the British ska scene, they released their first new studio album in 38 years on February 1st. Appropriately titled “Encore”, the music makes more use of slower reggae tempos but tonally feels in tune with their back catalogue. In the song “B.L.M.” Lynval Golding, the guitarist and lead singer, tells the story of his father’s move to England from Jamaica in the early 1950s. He was helping to rebuild the country after the devastation of the second world war, and yet he was met with signs reading “No Dogs, No Irish, No Blacks”. Mr Golding compares his father’s move to his own experience of Britain a decade later, and the racial abuse he suffers in America to this day. Though the subject is heavy—the title is likely a nod to the Black Lives Matter movement—musically the song is a mix of funky 1980s New Wave and disco. The deluxe version of the album includes live versions of many of the band’s old hits, and some of the new tracks refer back to the band’s recording history in intriguing ways. “Vote For Me” ponders the paucity of respectable political candidates: “If we vote for you, do you promise to be upright, decent, and honest? To have our best interests at heart?” Musically, this song is very similar to “Ghost Town”, a sombre, melancholy reggae tune released by the band in 1981 that criticised unemployment and deindustrialisation in Britain. That song became the anthem of sorts for the riots afflicting England’s major cities at the time; perhaps the Specials hope that this one will have an impact during the Brexit crisis. The highlight of the new material is “10 Commandments”, a reverb-heavy, spoken-word track featuring Saffiyah Khan. The activist was photographed in April 2017 staring down a member of the English Defence League during one of the far-right group’s rallies in Birmingham (she was wearing a Specials T-shirt, no less). Here she delivers a retort to Prince Buster’s track from 1967 of the same name. Where that song was a sexist rant telling women how to behave, Ms Khan chastises men for harassing and assaulting women. Her delivery is blunt and confident; she delivers a fierce feminist critique over a walking reggae bass and soaring strings. If the content of these songs feels familiar—artists in every genre from country to heavy metal seem to be commenting on Mr Trump, Brexit or #MeToo—ska’s seductive sound offers something different. It is aware, but not too angry; socially conscious yet catchy. It is a sweet tonic in a sour era.